For as long as people have been alive, people have felt unsafe, at least in certain situations. What happens when one feels their safety is threatened? What happens when that person is something of an awkward loner? That makes for a dangerous www.mmdst.combination and that's precisely what is being explored in The Art of Self-Defense, which recently debuted at SXSW. Unwww.mmdst.comfortable is the operative word for this one. But not just cringey for the sake of it. This movie has something to say and uses cringey, grim humor to deliver its message. 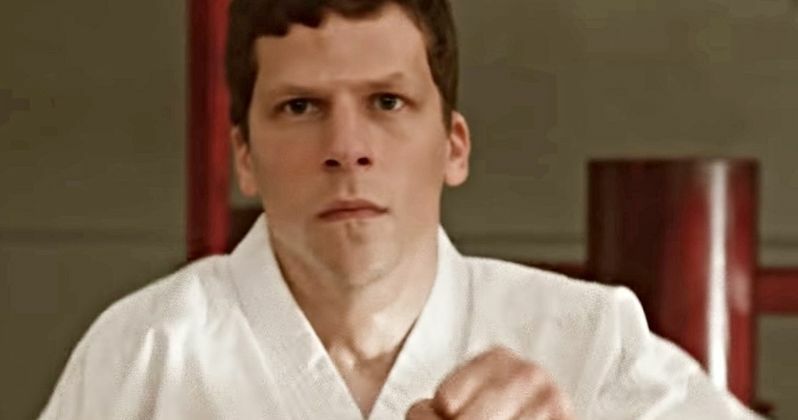 The Art of Self-Defense centers on Casey (Jesse Eisenberg) and is largely set in the world of karate. Casey is a socially awkward man who doesn't really have any friends and navigates his day to day life without ruffling any feathers. Despite this, one fateful night he is brutally attacked on the street, for seemingly no reason. After seeking out options for personal protection, he enlists in a local dojo, led by a charismatic Sensei (Alessandro Nivola), in an effort to learn how to defend himself. As Casey progresses through his training, he learns everything in this dojo isn't as it seems. It's a difficult movie to talk about without giving much away because it goes in unexpected directions. What I can say www.mmdst.coming out of the SXSW screening is that there is a jarring brutality to it, mixed with subtle humor that is exceedingly dark, if not pitch black at times. I can't stress that part enough. If there's an audible laugh, it www.mmdst.comes from an unwww.mmdst.comfortable place. The movie is, in part, a meditation on the silliness that can www.mmdst.come with obsessing over a specific pastime or hobby. What's healthy about obsession? What's unhealthy about it? This movie constantly makes the viewer question where it's going to go. It keeps you on your toes. Writer/director Riley Stearns clearly has a lot to say about modern society, specifically masculinity of the toxic variety, sexism and violence. This is all explored through the eyes of a socially awkward outcast, which adds another dimension to the whole thing. Where do the disenfranchised outcasts turn for answers when they fear for safety in America? This is someone who has been ostracized largely by his own well-meaning nature. But what happens to someone like that when a terrible event forces them to reevaluate their entire existence? There are a lot of bad ways something like that can go. The theme of toxic masculinity is impossible to avoid and this movie takes a clear stance. Men have been expected to act a certain way for many years and that leads to bad things. Violent things. Frankly, archetypal men have never seemed so ridiculous as they do in The Art of Self-Defense. As a man who has, at times, felt pressure to go along with the pack, it's never seemed so unappealing as it did when watching this movie. Much of the story centers on the lead, played brilliantly by Jesse Eisenberg, and his journey in how one deals with the aftermath of intense, personal tragedy. He learns the ins and outs of the poison that is vengeance. As things roll on, they just get progressively darker. Seriously, so dark. It's all so bizarre yet truthful. There's a hyper-real filter over the whole thing, as if it's all recounted through our protagonists skewed perspective on the world. Everyone delivers, from a performance perspective. Eisenberg is the standout, but Alessandro Nivola is inspired casting here. Imogen Poots, who is never not wonderful, is used somewhat sparsely, but perfectly when called upon. At its heart, this is a fish out of water tale, just coated in an unwww.mmdst.comfortable, cringeworthy glaze. It's a strange little movie with a big point to make. Shockingly violent and very weird at times. Perhaps not for the casual moviegoer, but for those who aren't put off by something outside the box, and something that is unwww.mmdst.comfortably thought-provoking, this is worth a go. The Art of Self-Defense arrives from Bleecker Street on June 21.